“Customize more” means that you can customize more things in AMSSE than other email programs. 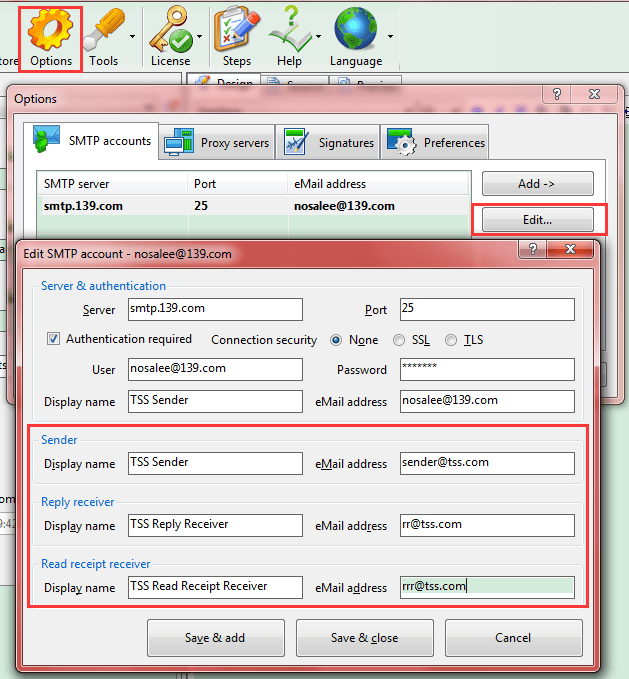 Screenshot 1: how to send email automatically, set your email account in our sending timed email software first. As above, these three display names and email addresses can be different than your email account. Please note that a few email servers request the Sender address must be the account address, if you set Sender address as othersa and get failed sending, please check here. 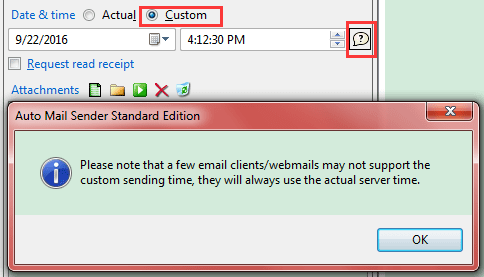 Screenshot 2: specify the custom sending time of our sending timed email software. In the email template header, choose “Custom” option for the Date & time field, and then specify the sending time as you wish. Click the question icon, you will see an important tips. So, if the custom time does not work, do not be surprised, some email programs support it, but some do not. Scene: for some reasons, your template may contain a folder attachment, e.g. you plan sending the daily logs of another program to the related colleagues, and the logs are stored in a fixed folder, so you attached this folder to an email template of AMSSE, and schedule it to sent out daily. In this case, you want every email only contains the new logs, so you need to empty the this folder after the daily email sent out. And the scheduled email will be sent out automatically, so you do not want and should not empty it manually. So, we designed this feature in AMSSE, in order to empty the attached folder automatically after sent successfully. It just a option, only need to check it, this feature will be enabled. 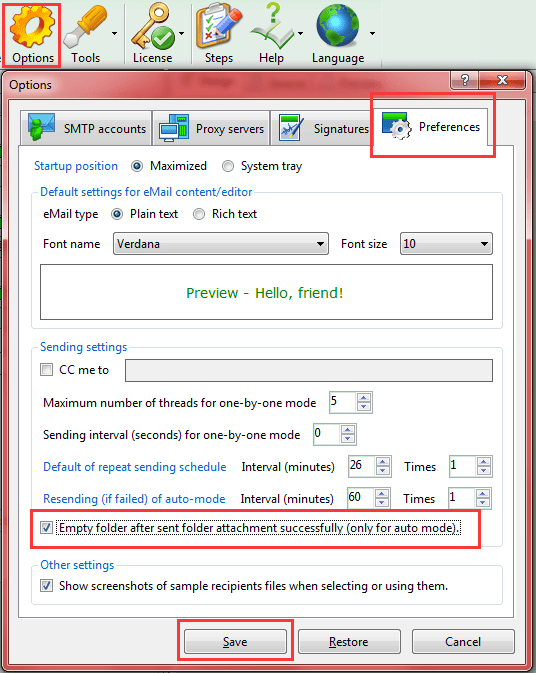 Screenshot 3: how to send email automatically? Set your preferences OK to use it better. Download AMSSE to Know How to Send eMail Automatically!